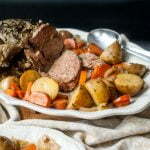 This is the time of year to make a nice slow cooker herb garlic lamb roast. Easy to make and the perfect way to celebrate the holidays with loved ones. Take the roast and cut little holes in it and stuff the garlic slivers into the holes. Make a paste with the olive oil, herbs and spices and rub all over the lamb roast. If you using vegetables, cut them and place in the slow cooker. Put the lamb roast on top, cover and cook on low all day.